No fewer than 59 Pot and Bedding Plant breeders proudly present their latest innovations, creative concepts and an incredibly wide range of crop assortments. 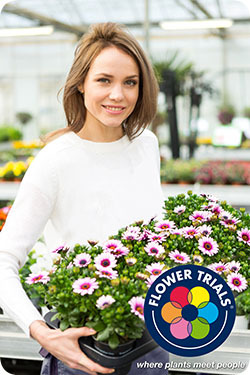 From technical information to retail inspiration, from breeding breakthroughs to latest trends, every professional in ornamental horticulture has a reason to meet at FlowerTrials®. Where: Open house at more than 30 locations in 3 regions: Westland & Aalsmeer in The Netherlands, Rheinland-Westfalen in Germany. When: 13th to 16th June 2017. Register your visit via www.flowertrials.com.